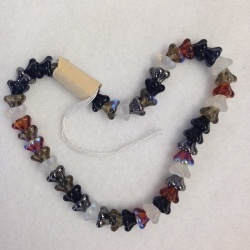 String of approx 50 flower-shaped beads, in good quality glass crystal. The beads can be strung as they are as a necklace, and also make beautiful earrings hung as single buds. There are at least 6 different colours in the strand.